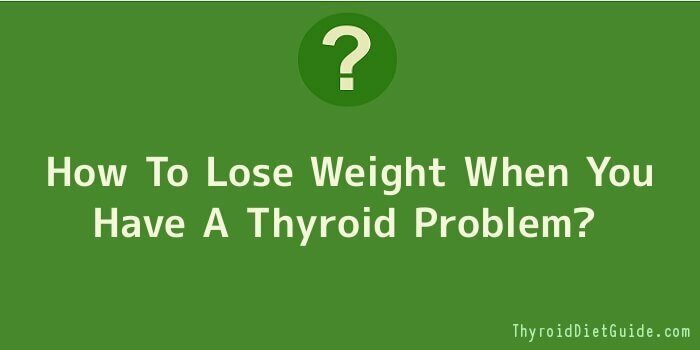 How To Lose Weight When You Have A Thyroid Problem? Not a great list of symptoms, but thankfully, after a couple of months of taking thyroid meds, the majority of the symptoms cease and you start to feel a little bit more functional. However, for many women in particular, the thyroxine meds don’t seem to do much about the weight gain and dreams of the weight ‘just falling off’ don’t seem to come true. So what are your options? More than you would think. To rely on just taking the meds to get your body back into the shape it was before is unrealistic. A tiny number of people are fortunate but they are usually the ones who didn’t gain more than a few pounds when their thyroid stopped functioning properly. For the majority, the weight loss is a very slow process and sometimes, the weight can continue to creep up despite the most meagre calories being consumed and 4 visits to the gym a week. It helps to understand the role of the thyroid in the body to appreciate why it has such a big impact on weight. The thyroid is an endocrine gland which sits in front of your larynx in your throat. It secretes two different hormones, T4 (thyroxine) and T3 (triiodothyronine) which are responsible for regulating your body’s metabolism and controlling how quickly reactions in your body happen. They are the nerve centre you could say. It’s from these hormones that your body gets the messages to burn energy and regulate your metabolism. So the thyroid, as small as it is, is responsible for how efficiently your body burns fat, for how much you weigh and for how much you sleep. When this stops functioning as ‘normal’, your metabolism slows down, the weight gain starts and the other symptoms of hypothyroidism start to reveal themselves. This can be a slow process and some people will suffer from hypothyroidism without even knowing it. However, once diagnosed via blood tests, medication can be prescribed which will help the thyroid to function properly. The damage to the way your metabolism functions can be far reaching however and this is why a low calorie diet does not necessarily get the same result as it would have done in the past. There are many diets on the internet – each offering to help thyroid sufferers get their figure back by following a simple diet. It’s an easy market because it’s a desperate market but unfortunately, many of these so-called ‘magic cures’ and instant solutions turn out to be ineffective and costly. However, the way to stop the weight gain and lose the weight could be much more straightforward. The answer could lie in what you are eating and not how much you are eating. And it’s about how you are working out and not how often. If anything, many people aren’t eating enough. And they aren’t taking the right supplements to give their thyroid a helping hand. Iodine is essential to make thyroid hormones and so when taking medication for your thyroid, you should always assist rather than hamper its effectiveness. Try reducing foods that suppress iodine like cabbage, broccoli, cauliflower, sprouts and spinach. Also, avoid peanuts, pine nuts and dried fruit. Also avoid caffeine drinks like coffee and cola. They can worsen the symptoms of an underactive thyroid. Give up smoking and limit alcohol intake too. You don’t have to remove these foods from your diet but they do not help your thyroid so it’s best to severely limit your intake of them. Foods that are rich in iodine and therefore helpful to your thyroid are oily fish, nuts and seeds, seaweed / kelp – sushi is a great source of this rather than the fried seaweed you sometimes get in Chinese restaurants. With thyroid problems comes a slower metabolism and even after the thyroid starts to function more efficiently again, the metabolism doesn’t always just speed up again. It’s important to amend not just the approach to diet but the approach to exercise in order to lose any weight. Previously, three sessions of exercise a week may have been sufficient to lose weight and tone up but with thyroid disease, the harsh reality is that the body will not respond as well to just this amount of exercise. At least 4/5 exercises sessions a week will get the results desired with plenty of emphasis on cardio vascular exercises. Ultimately, exercise and a low-fat and low-calorie diet will have an impact but they will take longer than they would on someone with a normal thyroid function.